Bonam means rice, rice cooked in a new pot which offered to Mahankali is called Bonam. Bonalu (Telugu: బోనాలు ) is a Hindu festival of the Goddess, Mahakali, celebrated in Telangana and Rayalaseema in India. It is celebrated in the month of Ashada masam. For village Goddess likes Bonam. In festival day people do head bath and wear new clothes especially ladies then they will buy new pot, in new pot they will cook pongali and rice in it, then they will decorate pot with kadi, pasupu and konkuma then they will cover the pot with lid, they will make lid as a lamp. This is called Bonam Jyothi. Goddess temples have names such as Mysamma, Pochamma, Yellamma, Pedamma, Dokkalamma, Ankalamma, Poleramma, Maremma, Pochamme, Maramma, Yellammma, Nookalamma etc. 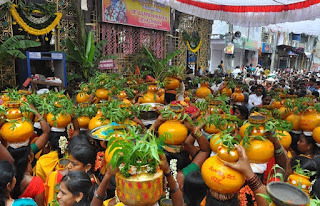 At the centuries-old Ujjaini Mahankali temple, women started filing in from 5 am itself with the 'bonam', ( a pot carrying rice, jaggery, milk and curd and covered with neem leaves and a lamp placed on it ) on their heads. Potharaju, the brother of Mother Goddess, is represented in the procession by a well-built, bare-bodied man, wearing a small tightly draped red dhoti and bells on his ankles, and anointed with turmeric on his body and vermilion on his forehead. He dances according to resounding drums. 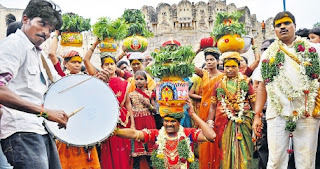 The Bonalu celebrations began last week at the Golconda Fort. After the Lashkar Bonalu at the Mahankali temple, the celebrations will move to the Old City and other areas of the city.